WATCH: Time-Lapse Video Shows Wall Of Smog In Beijing : The Two-Way The sky appears blue at the beginning of the 13-second video, then completely disappears from view in the haze of brown smog. Dozens of Chinese cities are currently under pollution alerts. 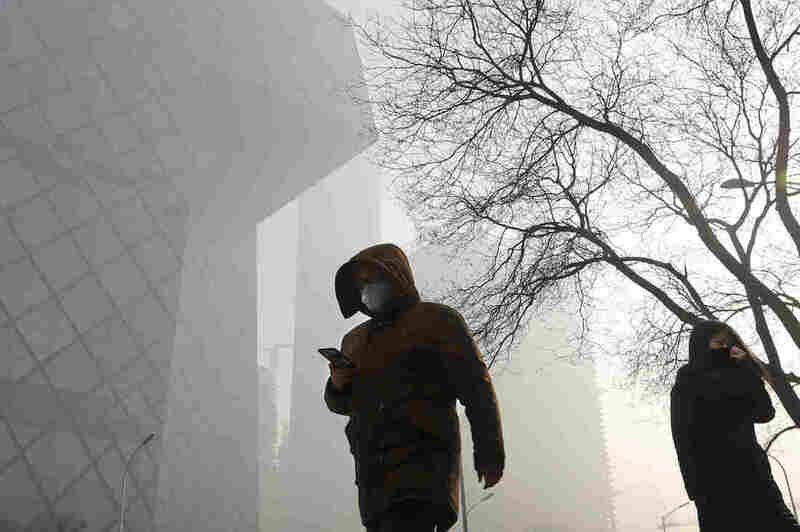 People wearing protective masks walk near the iconic headquarters of Chinese state broadcaster Central China Television in Beijing, which has been blanketed by heavy smog. Beijing's sky appears blue at the beginning of the 13-second video. Then it completely disappears from view, blotted out by a cloud of brown smog. The time-lapse video shot Sunday by Chas Pope, a British citizen, dramatically illustrates the extent of China's pollution problem. Pope says the thick haze moved into Beijing over the course of 20 minutes. Dozens of Chinese cities have suffered heavy smog for nearly a month. "State media report that 72 Chinese cities are under pollution alerts," NPR's Anthony Kuhn reports from Beijing. "Environmental officials have fined some 500 factories that have failed to cut emissions as the alerts require, and some 10,000 heavily polluting vehicles that are on the roads in violation of the alert." Some 40,000 inspectors have been deployed to make sure everyone is complying with required emissions cuts, Anthony adds. Twenty-four of the Chinese cities are on red alert, the most severe level of air pollution, according to a statement from the country's Ministry of Environmental Protection. Schools in red-alert areas were suspending classes, the ministry said. It added that conditions were expected to improve by Friday. The crackdown on industries that are violating environmental regulations is part of China's larger "war on pollution," now in its third year, Reuters reports. The news service says it's "aimed at reversing the damage done to its skies, soil and water after decades of untrammeled economic growth." But there are major challenges in curbing pollution. Recently, "state media have also reported that some local environmental authorities are tampering with air quality monitors to make pollution look lighter than it actually is," Anthony says. China's pollution issues also are exacerbated in the winter. According to The New York Times, "residents have come to expect such dense air pollution in late fall and winter, as people burn coal to heat their homes." A recent World Health Organization study found that China had the most deaths in the world attributable to air quality in 2012 — at 1,032,833.